An exhilarating trip that takes that takes you below the equator – this gay group trip to Ecuador shows you the best the country has to offer! Go riding on horseback through the Andean mountains, hike down an extinct volcano and bike down an active volcano, this group trip has it all. Combine scenery, culture, and adventure all into one trip and experience it all with other gay travellers. Today you’ll arrive in Quito and will be transferred to the upscale hotel for your first night. Your evening tonight is at leisure with activities starting in the morning to allow time to rest from flying. Today you’ll start your adventure in Quito where you’ll discover the magic of this UNESCO World Heritage Site. You’ll walk around the brick-laden streets of one of the best preserved historic cities in the Americas learning all about the many legends, stories and hidden treasures. You’ll take in sights such as the La Compañía de Jesús, the Museo de Arte Colonial and the Plaza de la Independencia before enjoying dinner at a local restaurant. In the evening you’ll make your way to the Hacienda which is found on the slopes of Rumiñahui Volcano in the El Pedregal Valley. After a hearty breakfast at the Hacienda, you’ll embark on an awe-inspiring trip horseback riding with spectacular views at the heights of Rumiñahui. You’ll spot real-life cowboys whilst getting to know your horse and riding down to the base of the Central Summit where you can see lots of wildlife and beautiful landscapes with twelve volcanoes. Lunch will be enjoyed back at the Hacienda and in the afternoon you’ll learn how to milk a cow and enjoy an Ecuadorian cooking class. Quilotoa is your first stop today – a long-extinct volcano crater where you’ll find emerald green waters. The drive to this location is absolutely superb and offers breathtaking views of the Andean mountain range whilst passing through the many indigenous town, farmlands and the ancient canyon of Zumbahua. 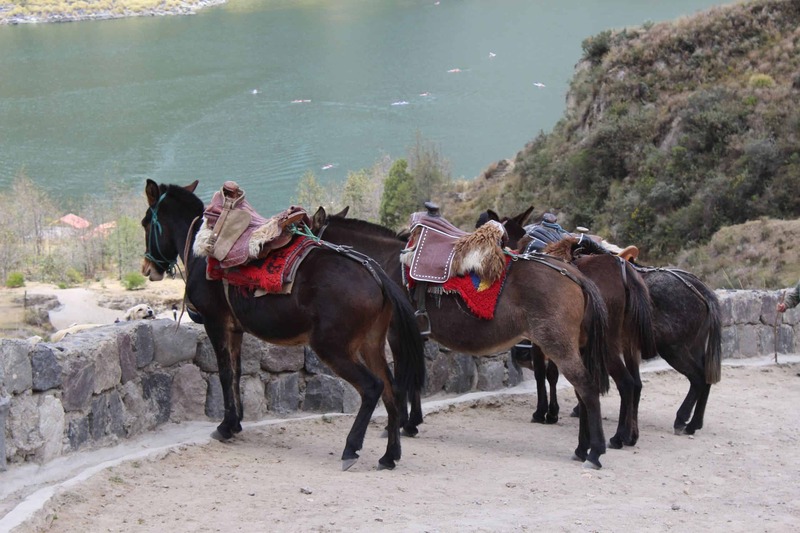 You can hike down to the lake shore and make your way back up on an optional mule ride followed by lunch. Dinner will be back at the Hacienda in the evening. An early departure takes you to Rumiñahui volcano, trekking along the highlands with the towering Andes mountains surrounding you. You’ll have great views as far as the eye can see of the valleys, mountains and volcanoes. The trek will be a full day of trekking and will be at a moderate pace and difficulty level. Dinner will be served in the evening back at the Hacienda. After enjoying your breakfast in the morning you will embark on an adventure programme that allows the team to come together and solve various puzzles and challenges, both physical and emotional, in a safe environment. You’ll then enjoy lunch at the Hacienda before hiking to the Red Trail. Whilst hiking on this trail you learn about the local wildlife, endangered species and the conservation efforts to keep the area as full of life as possible. On your final day you will enjoy mountain biking down the side of the Cotopaxi volcano which last erupted in 2015. The volcano is found in the Cotopaxi National Park and the mountain biking trip will be adjusted to suit the comfort levels of the group, led by a professional group of local guides. Along the way you’ll stop for lunch at Limpiopungo Lake where you’ll find birdlife conservation efforts, and if there is time, the ruins of an ancient Inca fortress known as Pucará del Salitre. After this you will make your way to Quito where you’ll enjoy a farewell dinner before heading to the airport ready to catch your departing flight.